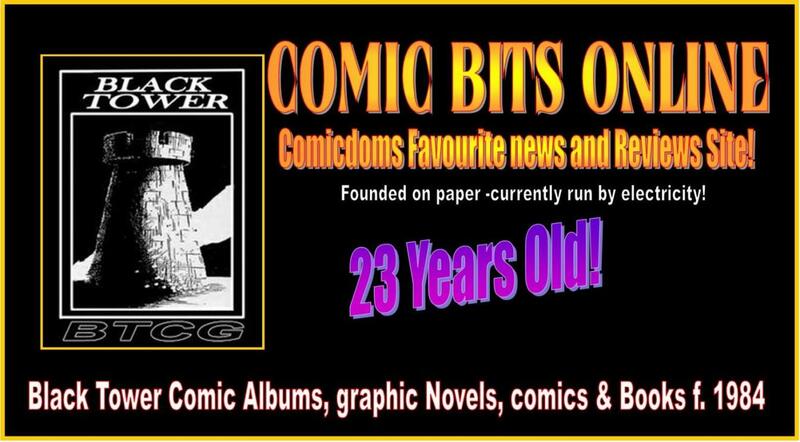 COMIC BITS ONLINE: Black Tower Graphic Novels, Comic Albums and Books! Black Tower Graphic Novels, Comic Albums and Books! All Black Tower comic albums (that is A4 format) are in black & white. Once you've had black and white you won't go back to colour, baby. 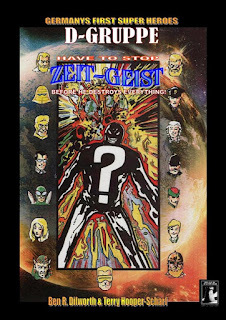 BTCG has specialised in presenting original material covering super heroes, crime, adventure, sci fi, horror as well as illustrated prose -not to mention ground breaking books on "world mysteries" and wildlife. Oh, and even a huge book of interviews with comic creators and publishers. All the books are, naturally, available for overseas licence -but we cannot translate work: that will be up to any licensed publisher. You can also find some on Amazon and other sources but they do not make me much money so, come on, buy from the online store and remember that at least these books will be collectibles! To contact me please check out "About" at the top of the page -thanks! To celebrate, at the time of publication, over 25 years of interviewing comic creators -writers, artists and publishers- this 365 pages book was produced. Interviewees included Yishan Li, Marv Wolfman, Dave Ryan, John Cooper, Mike Western, Donna Barr, Roberta Gregory, Sonia Leong, Emma Vieceli, Pekka A. Manninen, Alan Class, Karen Rubins, Kate Glasheen, Ron Fortier, Jon Haward, Franco Francavilla, Rick Geary, Tania Del Rio, The Etherington Brothers, Olivier Cadic (Cinebook the 9th Art), Holly Golightly and MANY others. Profusely illustrated with art and photographs! Reduced in price until October to £16.80 -an odd price but it's what the printer and lulu.com earn -I get zilch! 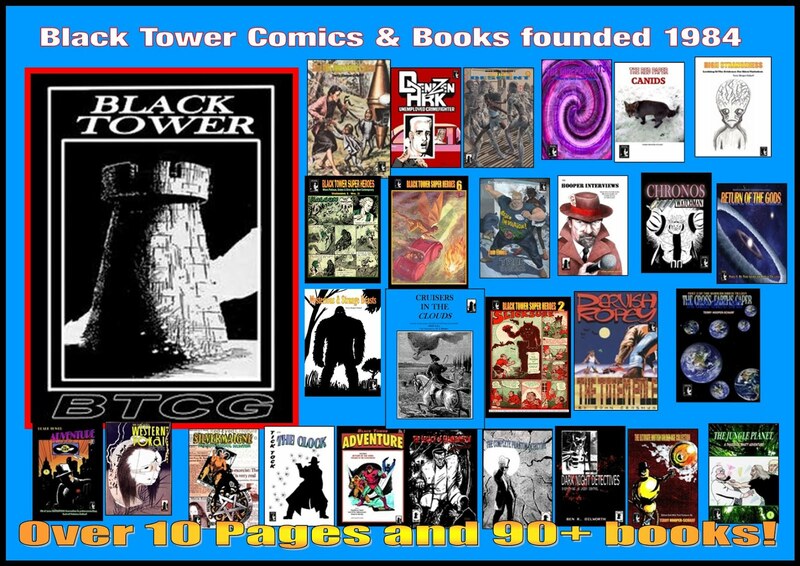 Black Tower Comics began in 1984 as a Small Press publisher of A5 (US -Digest size) titles such as Adventure,Presents,Windows and Hanley's Garage. 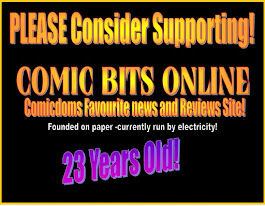 Then came the news, reviews, previews and interviews publication backed up by the mart and mail order service -Zine Zone (later Zine Zone International). In 2009, with the innovation in publishing of Print On Demand (POD), Black Tower jumped in head first! One of the first titles to see print in the new comic album format (A4) was The Bat Triumphant! This saw the complete story, begun in Black Tower Adventure vol. 1. William A. Ward's long lost 1940s character once again saw print as he fought a host of enemies in an attempt to reclaim his homeland. And while The Bat may have fought fist and nail to reclaim his homeland, another 1940s Ward creation, Krakos the Egyptian, seemed far from willing to claim a new Egyptian Empire as promised to him by the Gods. Tackling a number of foes and even encountering the Many-Eyed One, Krakos turned his back on the gods and the final panel of Krakos -Sands Of Terror, delivered a true twist! And, with something like 40 years worth of files and investigation reports could all that much delving into UFOs, lake and sea creatures and many other mysteries not result in a book or two...or three? Some Things Strange & Sinister, Some More Things Strange & Sinister as well as Pursuing The Strange and Weird: A Naturalist's Viewpoint set a precedence. 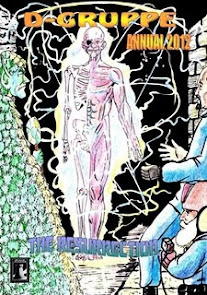 Whereas for decades those involved in "UFOlogy", "Cryptozoology" and "Forteana" declared many mysteries, that photographs were lost "to history" and so on, these three books swiped away the false claims. Alleged lost photographs -found. 'Mysteries' solved by doing actual research work and reading the sources -something others had never done. And, of course, mention natural history and Black Tower Books broke new ground with that in The Red Paper: Canids. But not all the prose books covered mysteries and wildlife. And if there is one thing "Herr Professor" loves it is discovering and presenting long lost UK Golden Age (1939-1951) comic strips and characters from publishers such as Gerald Swan, Foldes, Denis M. Reader, Cartoon Art Productions and others. Scanned and restored as best as can be considering the poor print quality of the rationing years -especially red, orange, yellow, blue and purple ink printing! Ace Hart The Atomic Man! The Tornado! TNT Tom! Dene Vernon! Acromaid! Cat-Girl! Bring 'Em Back Hank! 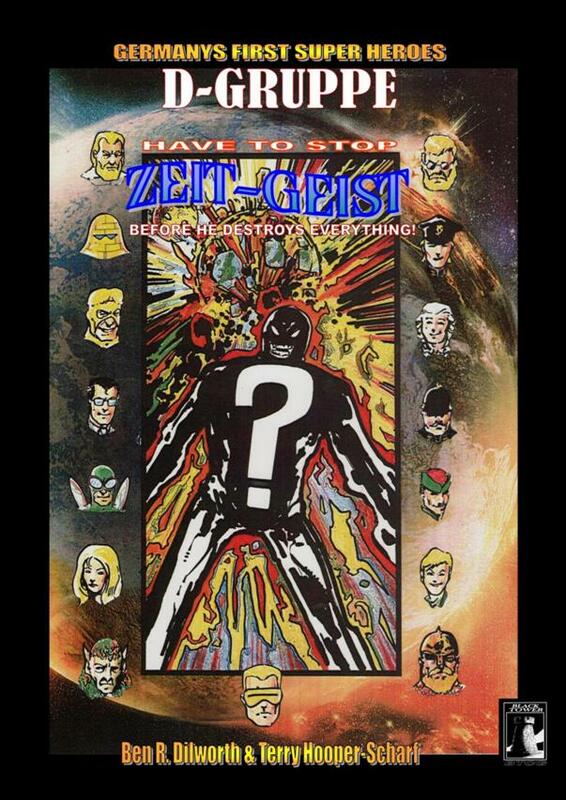 Robert Lovett:Back From The Dead and so many other action heroes and humour strip characters -William A. Ward, Jock McCaill and a host of known and unknown creators contribute -either in single volume " Black Tower Gold" albums or all six collected into the 400+ pager -The Ultimate British Golden Age Collection! Another great love is Centaur Comics from the United States. Right at the very start of the American Golden Age of Comics Centaur had creators who were ahead of the others! Before Plastic Man there was Plymo! Before The Human Bomb there was TNT Todd! Before Green Arrow and waaaaaaay before Hawkeye there was the mysterious red hooded archer called The Arrow! And, to just break your comic mind world there was even a Black Panther -decades before Kirby came up with his character of the same name. The Eye Sees All. The Owl. The Iron Skull. Amazing Man. The King of Darkness. The Invisible Terror. The Blue Lady. The Shark. Mini Midget & Kitty. Mighty Man. Super Anne. The company may have been short-lived but it's characters -oh boy! The two volume Centaur Heroes Collection has been compiled into one sweet 140 page comic collection! Horror. Ghost stories. The twist-in-the tale. Did you think that a publisher who is a big horror comic/film fan would ignore these? Nope. Each year since 2010, BTCG has published a Tales Of Terror anthology album and 2014s included some fun and spooky lost Swan Comic strips. I mean how can you go wrong -even Ben Dilworth is in these! The Church Of England has it's own basher of dark forces in the Reverend Merriwether -"God's Demon0-Thumper" as the press billed him. From an ancient Egyptian demon to a village of the damned and Varney the Vampyre, werwolves and a final confrontation with Satan himself -Merriwether pulls no punches and offers no compromise. And in those last few seconds between life and death, Merriwether's mind recalls past cases -thanks to Ben Dilworththe Tall Man of Osaka. Merriwether: God's Demon Thumper and Merriwether: The Test Of Satan are available as individual comic albums or in one swanky book The Collected Merriwether: God's Demon Thumper.